The third visit to Singapore was not only a significant one to Singapore but it was also significant to Sensei’s life as it was his last overseas trip. He has not stepped foot overseas since then. Compared to Taiwan and Indonesia where Sensei wanted so much to visit but did not manage to, Singapore received Sensei 3 times! Are we worthy of such an honour? 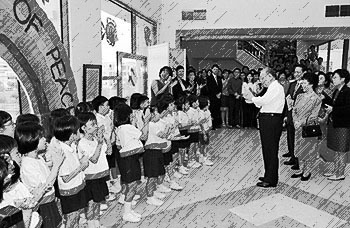 Spending a total of 6 days in Singapore from the 22nd to 27th November 2000, Sensei met with former Singapore President S. R. Nathan, paid his first visit to the SSA headquarters building and revisited Singapore Soka Kindergarten, where he unveiled a commemorative plaque. Sensei also received an honorary doctorate from Australia’s University of Sydney while attending the school’s graduation ceremony for international students that was held in Singapore. It is indeed ironical that the award that Sensei received from Singapore is from a University of Australia which specially arranged the conferral in Singapore and not from a local university. Reading Sensei’s guidance from the trip repeatedly, is there something Sensei wanted to tell all of us? Something particularly strikes my attention. In all the three visits, Sensei repeatedly mentioned the spirit of the lion king - the importance of standing up with courage. In the second visit, Sensei illustrated the story of Dr Martin Luther King’s struggle for equal rights for African Americans and how Mrs King’s determination and courageous actions saved Dr King and paved the way for the victory of the Birmingham campaign. He also related how Shijo Kingo overcome the numerous crisis he faced based on prudence, courage and firm faith. In his third visit, Sensei again talk about courage and related the story of Lim Bo Seng. He also explicitly warned against complacency in an organisation once the foundation has been built thereby losing the vibrant, pioneering spirit and passion for challenging new horizons! During this third visit, at the encouragement to representatives of Singapore in ICA, Sensei encourages everyone to live a way of life in which we strive to fulfil our mission based on faith in the Gohonzon. Buddhism exists to enable people to find true happiness. “Over the centuries, the true spirit of Buddhism was perverted and its priests came to think that people existed for the sake of religion, instead of the other way round.” Sensei says we must continue to practise Buddhism towards the realisation of kosen-rufu, always striving together with SGI. In the SSA-SGI Australia Executive Conference, Sensei talks again about the significance of the lion symbolism that appears in Buddhism. “No epic undertaking can be accomplished in a single generation. Only when the mentor’s spirit is inherited by the disciples, and passed on continuously to successive generation of disciples, can such undertaking be achieved. I, too, am confident that we have nothing to worry about and that the future of worldwide kosen-rufu will be secure as long as you, the members of SSA, are here walking the “lion’s path”. Sensei talked about Lim Bo Seng, the young Singapore hero who because of his resistance movement against Japan invasion, was imprisoned, tortured and died in prison. “The SSA has seen tremendous growth. There are now seven SSA community centres, with an eighth soon to be built in the northern part of Singapore (referring to Senja Soka Centre). There is a saying that starting and undertaking is easy but maintaining it is difficult. Human beings tend to lose the robust spirit to keep challenging themselves once a solid foundation has been established. Instead, they move into the defensive, growing conservative and self-protective. But it is precisely when the foundation has been laid that the real struggle, the real challenge, begins. No matter how ideal or comfortable the circumstances we may find ourselves in, we must never lose our vibrant, pioneering spirit and passion for challenging new horizons. We must stay on the offensive, always striving to take fresh initiative and to keep advancing. Even when Mr Makiguchi was in his seventies, he would punctuate his encouragement to young people with the words, “We, youth…,” including himself as one of them. In terms of his inner state of life, Mr Makiguchi was a youth all his life long. Being youthful has nothing to do with age. It is a matter of attitude and how you live your life. Youthful are those who stay true to the vows of their youth. Youthful are those who devote their entire lives to realising the ideal of kosen-rufu alongside their mentor. Youthful are those who strive to break through present circumstance and challenge themselves to move forward, even one or two steps. Youthful are those who refuse to be idle spectators and constantly seek to be active participants in things around them. It is my belief that those words are spoken with an insight of the situation in Singapore based on the Buddha's wisdom. 13 years have passed since the last visit. · Objectively, can we say that our membership has increased? · Have our members’ faith collectively grown stronger? · Have we created a wellspring of capable leaders? · Have we won over the battle against the devilish function obstructing the expansion of Buddha forces? · Have our organisation and our leaders lost the robust spirit of challenging or lapse into complacency? · Are we still challenging with the pioneering spirit that we once had, actively doing shakubuku and passionately working for kosen-rufu in the frontline? · Did the top leaders of SSA take such explicit guidance given by Sensei in Year 2000 seriously? Instead of renewing their vows for kosen-rufu, top leaders become defensive, growing conservative and self-protective. They persecuted those who spoke up with courage to point out their stagnancy and deviation from the founding spirit of the three presidents.